El-Wadud, Allah the Ever-Loving. Is Islam deficient in love? Say, “Call upon Allah or call upon the Most Merciful. Whichever [name] you call – to Him belong the best names.” And do not recite [too] loudly in your prayer or [too] quietly but seek between that an [intermediate] way (Quran 17:110). Allah – there is no deity except Him. To Him belong the best names (Quran 20:8). He is Allah , the Creator, the Inventor, the Fashioner; to Him belong the best names. Whatever is in the heavens and earth is exalting Him. And He is the Exalted in Might, the Wise (Quran 59:24). “And ask forgiveness of your Lord and turn unto Him in repentance. Verily, my Lord is Most Merciful, Most Loving (الودود)” (Quran 11:90). “And He is Oft-Forgiving, full of love (towards the pious who are real true believers of Islamic Monotheism)” (Quran 85:14). So, these are some of the implications of God’s Name ‘Ever-Loving’. One of the implications of this Name of God is that God loves His true servants by drawing closer to them and endears Himself to sinners by showing them Mercy and forgiving them and he loves all creatures by providing them with sustenance. God’s Name, ‘Ever-Loving’ has many implications, but to sum them up, it mainly implies love and affection. God’s name ‘Ever-Loving’ implies that God shows affection, kindness and love for His servants. So, God is Kind to His servants, loves them and grants them blessings. That is why God, Exalted be He, has called Himself, ‘The Ever-Loving’; one of His Attributes is ‘Ever-Loving’! By the way, everyone of us knows some loving people whom s/he are attached to. While I am speaking, you may be remembering a person who is loving and very dear to you. God is beyond compare; ‘The Ever-Loving’ is one of God’s Most Beautiful Names and this Name implies that He shows love and affection for you. Imagine God has called Himself ‘Ever-Loving’ for Man’s sake, as insignificant as Man is in the Dominion of God! Though Man is insignificant, God endears Himself to him. Remember this Saying? The 1st heaven is but a grain of sand in a desert, compared to the 2nd one and the 2nd heaven is but a grain of sand in a desert, compared to the third. For example, when one holds a small pebble and throws it in the desert, he would not be able to find it again! The 1st heaven is but a grain of sand in a desert, compared to the 2nd one and the 2nd heaven is but a grain of sand in a desert, compared to the third and the 3rd heaven is but a grain of sand in the desert compared to the 4th and the 5th heaven is but a grain of sand in the desert compared to the 6th and the 7th is but a grain of sand, compared to God’s Throne that is but a grain of sand, compared to His Seat. You are very insignificant, compared to God’s Dominion; God does not need creatures to worship Him. Though angels worship Him much more than you, you are a dear creature to God, the Creator. So, God calls Himself, “Ever-Loving” and He, Exalted be He, loves you. What do you think of that? God says: “His Seat embraces the heavens and the earth…” Do you realize how insignificant you are to God’s Dominion? Of course, you are very tiny; however, God loves you calling Himself, ‘The Ever-Loving’ for you. This has to do with Islamic Faith. What does this mean? We all should firmly believe that God is the Creator, Exalted be He. Do you have any doubts about God being the Creator?! As you believe God is the Creator, you should believe He is ‘The Ever-Loving’ and believe deep down in your heart that God loves and is Kind to His servants. In this series, we study God’s Names & Attributes that are cited in the Quran; one of His Names not cited in the Quran is ‘Al-Hannan’, (Ever-Tender). This Name is mentioned in some of the Sayings and is referred to in the Quran: “And tenderness (hanan) from Us…” As you believe that God is the Provider and as you believe that God is the Creator, you should believe that God is the Ever-Loving. You should believe that God loves you and endears Himself to you. How do you feel now?! You are the servants of the Ever-Loving God! God, Exalted be He, the Ever-Sufficient, does not need to love you! Remember this Saying? Muhammad said in every inch of heaven there is an angel prostrating or bowing to God till Doomsday and when the Last Hour comes, they will rise saying to God they did not worship Him properly. Despite all that, God loves you! Let’s move to the second point; what is the difference between ‘Al-Hob’ and ‘Al-Wid’ in Arabic? ‘Al-Wid’ is more inclusive than ‘Al-Hob’ in Arabic. How? Lexically speaking, ‘Al-Hob’ refers to one’s innermost feelings and the feelings for others that one hides deep down in his heart. ‘Al-Wid’ in Arabic implies translating one’s feelings into actions. Why does not God call Himself ‘Al-Habib’ (Beloved) in Arabic? This is because ‘Al-Wid’ is more inclusive and greater than ‘Al-Hob’, so He calls Himself ‘Al-Wadud’, (Ever-Loving). On hearing God’s Name, ‘Ever-Loving’, you should be ashamed of sinning and feel deep love for God and declare that you love Him. ‘Al-Hob’ refers to inner feelings; ‘Al-Wid’ refers to actions demonstrating love. ‘Al-Hob’ is an inner feeling but ‘Al-Wid’ is translating one’s feelings into actions. ‘Al-Wid’ is expressed by one’s actions but ‘Al-Hob’ is just an inner feeling. When one tells you he has good feelings for you, this will be ‘Hob’, but if he smiles at you, this will be ‘Wid’. If one hides great feelings toward you, this will be ‘Hob’ but if he gives you a present, this will be ‘Wid’. If one wishes you all good deep inside him, this will be ‘Hob’ but if he speaks well of you in front of you, this will be ‘Wid’. God is beyond compare; He calls Himself, ‘Al-Wadud’ (Ever-Loving). I will keep asking you this question throughout today’s program: What do you feel about God’s Name, ‘The Ever-Loving’? Last time we talked about ‘The Subduer’ that denotes holding God in awe, but today, we are discussing God’s Name ‘Al-Wadud’ (Ever-Loving) and not ‘Al-Habib’, as ‘Wid’ is more inclusive in Arabic. We said ‘Al-Hob’ in Arabic refers to one’s inner feelings, but ‘Al-Wid’ implies translating these feelings into actions. So in Arabic, ‘Al-Wadud’ is the Ever-Loving and not just Loving, ‘Moheb’ in Arabic! God the meaning? One may love you without doing anything thta shows his love for you and so, you may tell him that his love is of no use to you! You may say so to those whose actions do not show their love for you! One who is ‘Wadud’, (ever-loving), is not just ‘Moheb’ (loving); ‘Wadud’ (ever-loving) is more inclusive than ‘Moheb’ (loving)! These are examples, but God is beyond compare. God, Exalted be His, is Ever-Loving and so He loves His servants most. Is that ‘Hob’ (Love) or ‘Wid’ (True and Sincere Love)? Of course, it is ‘Wid’! If God loves one, He orders Gabriel to love him, and then people will be pleased with him. And you know more certain of God’s love for you? Imagine that I have a thermometer that I will use to measure how you sense God’s love for you! I can see a little boy smiling here; since he is smiling, God willing, the rest of the audience here will be sure God loves them. God, the Ever-Loving, says: “And He is the All-Forgiving, The Ever-Loving. Lord of the Throne, the Glorious; Doer of what He intends.” Do you feel much love for God, the Ever-Loving?! Glory be to God, the Ever-Loving One! Let’s see the difference between this Name and some other Names of God. Is this Name of God different from His Names: Most Merciful, All-Forgiving and Oft-Relenting? Some cannot distinguish between them, thinking God’s Names, ‘Ever-Loving’ and ‘Most Merciful’ are the same. There is a big difference between them; let me explain with an example. Man is a very weak creature whose needs are endless. He needs to eat and drink and so, God, the Supreme-Provider, provides for him. Man needs protection so the Supreme Preserver and Protector protects him. Man needs to learn to improve and so, God, the Most Merciful, teaches him as we said in the program on God’s Name, ‘Most Merciful’. We need knowledge; the Opener & All-Knowing opens doors to knowledge. Man needs strength and honor and so, God, the Almighty, grants him these. Man needs strength, protection, knowledge, sustenance and education. Besides these things, Man needs another crucial thing. Do you know what it is? He needs love and affection and to be treated kindly; Man instinctively needs this! Man needs someone to treat him gently and say nice words to him; the other needs are very important for Man, but they cannot make up for his need for affection and love. God, Exalted be He, calls Himself the Most Merciful, the Ever-Generous, the Provider and the Almighty, but as Man needs affection and love, God calls Himself, ‘The Ever-Loving’. See how God, Exalted be He, is All-Aware of your needs! God meets all the needs of Man as he is a dear creature to Him. God says: “I am creating viceregents on the earth.” God is beyond compare; take the example of a child! What are the needs of a child? He needs his parents to raise and educate him, and support him, clothe and feed him, and send him to school! What else does a child need other than all these? A child needs his parents’ compassion and love! He needs to enjoy their embraces and words of kindness! Psychologists say a child is filled with self-confidence when his father tells him that he loves him & is filled with compassion & joy when his mother tells him she loves him. So, such words of parental love lend confidence, joy and compassion. How amazing! God is beyond compare! God wills parents to be there in their children’s lives, not just to raise them; the whole Universe revolves around parental love. I daresay raising children is not the only reason for having parents for they should lead one to knowing God! Muhammad said, “God is more Merciful to one than his own kind mother.” Parental love should make clearer the idea of God’s love for Man! Parental love is a sign of God’s love for us! So, God’s Name, the Ever-Loving is really great! Ali ibn Abu Talib said if he were to be given the choice, to be questioned on Doomsday by his parents, he would refuse as God would have Mercy on him more than his parents! Only a man knowing God, the Ever-Loving, could say such words! Ali was surely aware of the implications of God’s Name, the Ever-Loving, and must have lived by God’s Names for only someone who did could say so. Ali, God be pleased with him, really sensed God is the Ever-Loving! Understand the implications of God’s Name, the Ever-Loving? Some believe only children need kindness, but the truth is the more you grow up, the more kindness and love you need! The more you grow up, the more you need love and compassion! One may be too vulnerable and hurt if deprived of such emotions! One may have money, a good career and an active life, but still, he needs love and kindness! People in the West are obsessed with materialism and so, they find difficulty in meeting their emotional needs, unlike our case, for God has called Himself, the Ever-Loving! God meets all our needs; the materialistic ones by providing for us, and the spiritual ones, being the Ever-Loving! Having seen this example, let’s ponder on some related Universal Signs! God, the Ever-Loving, endears Himself to you in two ways: First, He endears Himself to all people, Muslim, non-Muslim, believers or disbelievers, religious or not. This is because God is the Ever-Loving! The Universe abounds in Signs of God’s Love! Look at the Universe and the creatures God created! Everything in the Universe is a Sign of God’s Love for Man: The Sun, the Moon, the rivers, the seas, the flowers and the plants. Let me give an example! All these creatures which I have mentioned perform functions for which God has created them so that life goes on. They help Man get his sustenance. But they are also Signs of God’s Love for Man. Sustenance could have come from unattractive sources. What are the functions of the Sun and the Moon? The Sun provides us with solar energy and the moon controls the tides! These are not their only functions as willed by God, the Ever-Loving. Think about how the Sun looks at sunset! The Sun gives us energy and also gives us a beautiful view! Have you ever seen the Sun at sunrise? The way one’s heart is moved by a beautiful sunset is a Sign of the love of God, the Ever-Loving, Glory be to Him! The reason the night was created is to be the time of rest for people; God the Ever-Loving says: “And by the calm of night…” Night is the time when one can enjoy the gentle breeze and lovers can enjoy their time together! The beautiful night could have been just dark and gloomy, but it is not. Understand my point? In daytime, it may be hot, but God, the Ever-Loving, provides shade. Besides its main function, the moon’s reflection on water is a beautiful sight that overwhelms our hearts with joy! Praise the Ever-Loving whenever you gaze at the moon’s reflection! Praise God, the Ever-Loving, Who provides such Signs! This applies to other creatures such as fish. Though there are many species of fish, Man can eat only a few. Why are there fish species Man cannot eat? We enjoy their beauty. Look at the Universe with fresh eyes to feel God’s Love for us! If everything has a practical function in Man’s life, why do flowers exist? They provide sweet perfumes and are pleasing to look at! Every time you see a flower, praise God, the Ever-Loving! There are many species of birds, some are edible, others are not! We eat a few kinds of birds; the others are there to make life pleasing, a Sign of God’s Love! Consider the different types of food you find on your table! The basic foods essentail for one’s survival, may be, for example, a slice of bread, some rice and a piece of meat, right? But God, the Ever-Loving, created diverse kinds of fruits in the Universe for Man to eat, not to mention hazelnuts, almonds, and pistachio. Of course, Man would not die if he did not eat pistachios! Also cuts of meat vary in quality; ribs, steak; some taste better than others. I’ll tell you a simpler example; of course God is beyond compare. Suppose a friend invited you to dinner; when you went to him, you found water, rice and meat; this would be O.K. since you found the basic kinds of food. Another friend may invite you and offer you rice, meat, and water all sorts of delicious foods and an abundance of fruits, served on a lavish table with flowers, and scents! The first friend fed you, but the other showed how much he loved you! Use this example to see Signs of God’s Love in the Universe proving how much God loves you. That was our first point. Look at the Universe with a fresh eye! After this program, try to see God’s Love in the ordinary things surrounding you like the kinds of food you will find on your table tomorrow. Try to feel God’s Name the Ever-Loving, Glory be to Him! Contemplate the Universe, and you will find Signs proving God is Ever-Loving for all the people, even the disbelievers. Now let’s move to another point. I know some must be wondering about God’s special Love, but first I had to mention God’s Love for Man in general. From now on, you will sense God’s Love on seeing the Moon or sunset! When you see a rainbow, you will automatically praise God, the Ever-Loving! You will be looking at the Universe as a big mosque, as we mentioned before! Look at the Universe with fresh eyes! Let’s talk about God’s special Love for certain people, namely, all believers, this kind of love is not confined to Prophets, or martyrs. What proves it is a verse that many do not understand or just skim through! After you hear this verse, you will be overwhelmed by love for God! “Surely those who believe and do righteous deeds, on them will God Most Gracious bestow His love” [Quran 19:96]. There are many aspects of God’s love for the believers; let’s talk about God’s Love for a man we all love, namely, Muhammad (PBUH). Let’s see how God showed His Love to Prophet Muhammad (PBUH). Remember what Hira’ Cave looks like? Its rock formed an embrace, as if the cave were embracing him (PBUH)! Remember the first thing Gabriel did to Prophet Muhammad (PBUH) was giving him a firm embrace. Remember when the Prophet (PBUH) was severely abused; God said to him: “And wait patiently for the judgment of your Lord, surely you are in Our Sight.” See how this verse shows God’s special Love for him? It implies God would watch over Muhammad (PBUH). When he (PBUH) was forced to leave Mecca, he wept, then God revealed verses that showed how much God loved him; God says: “He Who ordained the Quran for you will return you…” After Uhud’s Battle Muslims suffered and many Companions were injured and the Prophet (PBUH) was injured and everyone was depressed, then God revealed verses showing love and kindness generating a soothing effect! God says: “And do not weaken nor (feel) sorrow while you are the superior if you are believers. If you are afflicted with a wound… a would like it has also afflicted the unbelievers…such are…days We alternate among…people…that the believers may prove themselves and He may take martyrs from…you…” [Quran 3:139-140]. What do you think of these verses? God revealed verses of tenderness: “And tenderness from Us…” “…those who believe…on them will God Most Gracious bestow His love” [Quran 19:96]. When Gabriel did not descend to the Prophet (PBUH) for 6 months, Quraish taunted him saying Muhammad’s God had forsaken him. This saddened him much, so God revealed a Chapter about this. A complete Chapter of the Quran was revealed to console Muhammad; many have recited it and it will be recited till Doomsday! God says: “By the forenoon And by the calm of night, Your Lord has not abandoned nor is He displeased with you” [Quran 93:1-3]. 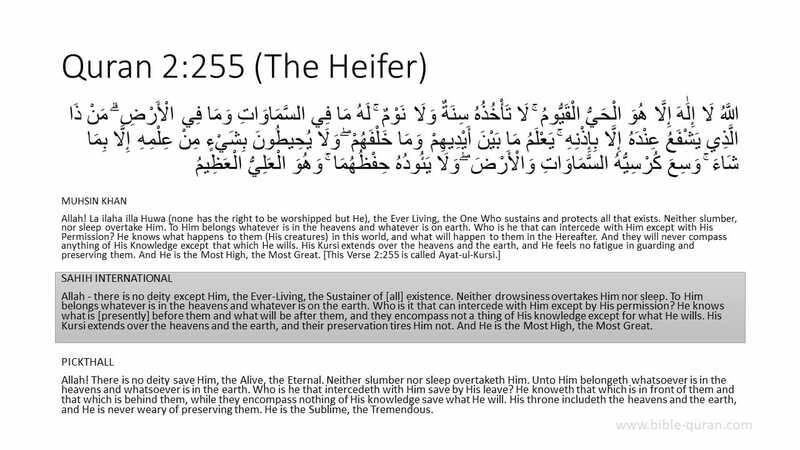 Imagine how your beloved Prophet felt when these verses were revealed. The Lord of the Worlds, Master of heavens and earth consoled him; “His Seat embraces the Heavens and the earth…” [Quran 2:255]. God consoled Muhammad, His servant & beloved Messenger (PBUH), saying: “Your Lord has not abandoned you nor is He displeased with you” [Quran 93:1-3]. God never forsook Muhammad (PBUH). “The reward in the next life will…be better for you than the worldly gains. Your Lord will soon grant you…” [Quran 93:4]; God filled Muhammad (PBUH) with hope about the future. “Did He not find you as an orphan and give you shelter?” [Quran 93:6] God has never forsaken you either! Look back at your life and feel God’s Love for you read “The Forenoon” Chapter and apply it to yourself. Reading, “Did not He find you as an orphan” [Quran 93:6], think how you were penniless but God helped you marry. Remember when you weren’t religious then God guided you to His Way! It is the Ever-Loving Who helped you make Lesser Pilgrimage. God revealed 3 verses showing He has not forsaken Muhammad (PBUH): “Did He not find you as an orphan and give you shelter?” [Quran 93:6]. The word ‘shelter’ shows God’s Love for the Prophet (PBUH). “Did He not find you wandering about and give you guidance” [Quran 93:7]? Look at past events in your life in which God’s Love for you, manifested. During the break, I want everyone to do so. “Did He not find you as an orphan and give you shelter?” [Quran 93:6]. “Your Lord will soon grant you sufficient favors to please you” [Quran 93:5]. See the first verse “By the forenoon And by the calm of night” [Quran 93:1]. God cites two times of the day that are best for love; God swears by the forenoon and the calm of night; God does not swear by the dark night, but by the calm night inspiring serenity see how Universal Signs showing God’s Love is linked to our lives as in “The Forenoon” and “The Criterion” Chapters & the following one; God says: “Have not We comforted your chest for you?” Look into your heart to see Signs of God’s Love for you. How often do you shed tears out of piety in Ramadan, pray submissively, expressing your love for God? How often do you ask God to be pleased with you? How many times have you felt close to God and sensed His Love? Those who haven’t felt this way are either unaware of the Love God has shown you, which is a problem, or He does not show you it as you do not deserve it, and that is a catastrophe. There are only two possibilities given God is the Ever-Loving, either He is showing you His Love but you do not notice it, which is a problem, for then you will not be showing gratitude! Or you may not be deserving of God’s Love, that is a catastrophe. “Surely those who believe and do righteous deeds, on them will God Most Gracious bestow His love” [Quran 19:96]. Keep thinking of God’s Love for you! See you after the break! In the Name of God, praise be to Him, and peace be upon His Messenger. As you believe that God is the Creator and the Supreme Provider, you have to be certain that God is the Ever-Loving, Who endears Himself to His servants He says: “…tenderness from Us…” “…those who believe…on them will God…bestow His love.” Now let’s take examples from our own lives. It is wonderful that the Ever-Loving likes His servant to resort to Him, talk to Him and pour his heart out to Him. There is a difference between pouring your heart out to God and invoking Him; God is also the Answerer of Supplication, as He says: “Call upon Me and I shall answer you…” This is different from when you pour your heart out to God! You can pour out your heart to Him, complaining to the Ever-Loving. God is beyond compare; if you love somebody and you feel depressed, you may go to him and pour your heart out to him, and take the load off your chest talking to him. God is beyond compare; have you ever tried to pour your heart out to God? Have you ever talked God, the Ever-Loving? This is one of the implications of this Name, the Ever-Loving: pour your heart out to Him, not asking for something. True, you should invoke Him asking for help as God says: “Call upon Me and I shall answer you…” “God will be angry with those who do not make requests of Him. There is another sort of worship that suits His Name,the Ever-Loving; turning to God, complaining to Him, pouring your heart out to Him! You may do this when you are all alone in a dark room. Pouring your heart to God is a great act of worship! If you talk to God, you will experience sweet feelings in your heart! Such sweetness is but a blessing from God, the Ever-Loving. You can do this at home, driving your car, or going back or forth to work. You can always pour your heart to God, being your Only Resort, feeling vulnerable, and asking Him to make you steadfast after Ramadan. You may talk to God, the Ever-Loving, as an outlet for your sorrows. Though this is a great kind of worship, many people are heedless of it. Resort to God, the Ever-Loving, and sense that sweetness in your heart! Humble yourself before God, the Ever-Loving, and seek His pleasure; Tell Him of your concerns about your children and tell Him you need His Help. Tell God that you and your children are so vulnerable. Confide to Him that you are afraid of certain people, at work or elsewhere; tell God that without His Support, you would be helpless and lose everything! Can you talk to God like this in private? This is a great worship act; does it have any origin in Islam? What would such an old pious mother want for her daughter? She must have been worried about her helpless girl, dreading she might not serve God’s religion well! She must have wondered who would raise her, given her mother was old! After all, she was a girl who could not earn her living like a man! The following verses denote God’s Love for that mother who turned to Him: “So her Lord accepted her (Mary)…and endowed her with purity as she grew…” So, God granted all the mother’s wishes. “…and entrusted her (Mary) to the care of Zacharias.” Mary was entrusted to Zacharias’ care, and grew up to be pious. “…entrusted her to…Zacharias. Whenever Zacharias entered the santuary, he found her furnished with provision…” All this was thanks to Mary’s mother pouring her heart out to God! Try this beautiful worship and talk to God, the Ever-Loving. It is worship that draws you close to God through His Name, Ever-Loving. He likes you to talk to Him, and pour your heart out to Him; He likes you to resort to Him and humble yourself before Him, and complain to Him about Muslims’ conditions hoping to serve Islam. Pray for Islam just as Mary’s mother wanted her child to serve religion! Can you resort to the Ever-Loving and turn to Him as such? When Prophet Muhammad was stoned when he went to At-Ta’if, he said: “O God, I complain to You about my weakness, lack of resources…” Can you say these words to Him? Tell God of your worries and sorrows, whether you are old or weak, or helplessness when facing a problem that you cannot solve on your own. “I complain to You of my weakness, lack of resources and humiliation…You are the Lord of the Worlds, and the Lord of the persecuted, and You are my Lord. To whom will You entrust me? To someone far away who will frown at me or to an enemy…You have given power over me? If You are not angry with me, I mind not…” This is not an invocation; it is a secret talk with God. This is how you pour out your heart to God; this is how you address God, the Ever-Loving. You may sit in your bed and find yourself saying: O Ever-Loving God! We should try this beautiful act of worship, and teach it to our children in order to worship Him well and please Him, and endear themselves to God this way. Everyone has a copy of the Quran in which God expresses His Love for us: “And He is the All-Forgiving, the Ever-Loving.” “Surely those who believe and do righteous deeds, on them will God Most Gracious bestow His Love.” “And Tenderness from Us…” See how God honors Man?! Why are many people so hard-hearted that they do not feel God’s Love?! Let’s ponder on God’s Name the Ever-Loving and consider some verses and Sayings that explain this Name: God, Exalted be He, says: “…then God will bring a people He loves, and they shall love Him.” God mentioned His love for them first, then said they would love Him! Prophet Muhammad (PBUH) said: “On the Day of Resurrection, God will say, ‘O Adam!…God orders you to take out from among your offspring the group for Hell’ Adam will say, ‘O Lord! Who are the group for Hell?’ God will say, ‘Out of each thousand, take out 999. '” so, only one out of 1000 will enter Paradise! On hearing this, the Companions covered their faces and sobbed; they were very emotional and conscious of Hell and Paradise! The Prophet went hom and Gabriel visited him and said God asked why Muhammad disappointed His servants and ordered him to return to bring them glad tidings! Muhammad went to them and said: “From Gog and Magog 999 will be taken out (to Hell) and one from you, and I hope you (Muslims) will be one fourth of the people of Paradise.” Then, Everyone said: “God is the Greatest”. Then Muhammad said: “I hope you will be one third of the people of Paradise.” Everyone said: “God is the Greatest.” Then Muhammad said: “I hope you will be one half of the people of Paradise.” Then, Everyone said: “God is the Greatest”. See how God, the Ever-Loving, sends glad tidings to His servants, expressing His love for them and showing how He is pleased with them! Prophet Muhammad said: “Nations were displayed before me: one or two Prophets would pass by along with a few followers. A Prophet would pass by accompanied by nobody. Then, a big crowd of people passed in front of me and I asked, “Who are they? Are they my followers?’ It was said, ‘No. It is Moses and his followers.’ It was said to me, ‘Look at the horizon.’ Behold! There was a multitude of people filling the horizon. It was said to me, ‘This is your nation out of whom seventy thousand shall enter Paradise without reckoning.” Then Muhammad asked God to let more people enter Paradise without reckoning, so God added to each 1000 of them another 70,000! See how God, the Ever-Loving, bestows His blessings on us? Prophet Muhammad said: “The Fire will not touch two pairs of eyes; the one that sheds tears out of fear of God…” The tears one sheds out of love for God are so dear and precious to God that He won’t let Hell-Fire touch eyes that shed such tears! See how God is Ever-Loving? He will grant safety from Hell for everyone who cries out of love for Him! Listen to the next impressive Diving Saying: “I am with My servant as long as he remembers Me and by My remembrance his lips move.” I want you to say right now: There is no deity but God; all praise to God; there is no deity but God; God is the Greatest. God says: “Therefore remember Me, so that I may remember you.” “If he (God’s servant) remebers Me in himself, I too, remember him in Myself; and if he remembers Me in a gathering, I remember him in a gathering that is better than it.” See how Loving God is? Companion Uthman ibn Abu Talha went to the Prophet and told him that he suffered pain in his body. He could have implored God to heal Uthman, but he wanted to teach him so he (Uthman) would feel closer to God! Muhammad said to him: “Place your hand at the place where you feel pain and say, ‘In the Name of God’ three times, then say seven times: ‘I seek refuge with God and His Power from the evil that I find and that I fear. '” Uthman did that and he was cured; after that he taught those very words to his friends and family. Such a special link between Man and God! Once, Muhammad suddenly rushed out of his house, he found a group of the Companions and asked what they were doing. They said they were making remembrance of God. He asked if they were not doing anything else, and they said they weren’t. He (PBUH) explained that he did not suspect them, but he was told that God was boasting about them among the angels! See how loving and caring God, the Ever-Loving, is? It was reported that God told Prophet David: If the disobedient had known how I (God) long for their repentance, they would have yearned to turn to Me (in repentance)! O David, if this is how I long for the disobedient, imagine My love for the obedient! If God longs for the sinners repentance, what about His love for the obedient?! God, the Ever-Loving, reproaches His servants gently saying: “Has not the time come that the hearts of those who believe should be humbled by the remembrance of God…?” See how God reproaches believers gently? Let’s see how God orders women to adopt the veil: “O Prophet! Tell your wives and your daughters, and wives and daughters of the believers, to extend their outer garments around themselves…” The rest of the verse is full of love: “…so that they would be distinguished and not harmed.” God ordained the veil to protect women from harm; so they would not be harassed in the streets, being dear to God! “…so that they would be distinguished and not harmed.” The veil is a symbol of their piety and so people will not harass them! Ever thought of the veil as a sign of piety and closeness to God? A woman wears the veil for protection so all can know she is close to God. If women regarded the veil accordingly, they would not hesitate to adopt it to please God, the Ever-Loving! God, the Ever-Loving is the One Who instilled in our hearts love for each other. Sometimes we gather with our friends, enjoying each other’s company feeling happy, laughing and losing track of time, without doing anything sinful. It is all thanks to God, the Ever-Loving. When the family gathers and the joy they feel, with the children all there, is this not a blessing from God, the Ever-Loving? What about marriage and the affection between couples? God says: “And from His Signs is that He created from yourselves your wives, that you find serenity with them and He has set between you affection and mercy.” Is this not a blessing too? Isn’t God the One Who instilled in fathers love for their children? Ponder the Universal Signs, life experience, the Quran and everything, trying to see how God, the Ever-Loving, is inviting you to turn to Him and enjoy His Love. Mothers’ tears on bidding their children farewell are but a Sign from God, the Ever-Loving. Mothers’ waking up many times at night to check on their children is another Sign of God’s Love! See the Ever-Loving God’s blessings? Why do pilgrims say theyhave come to please God alone? Because: “All praise, blessings and dominion are Yours. You have no partner!” One of the followers of the Companions made Lesser Pilgrimage repeating: “Ever at Your service, You have no partner…” Then he said: “O God! I have been longing to come to You (by performing Pilgrimage), so help me come closer to You very soon (By going to the Kaaba)!” So, performing Lesser Pilgrimage fosters love between God and one. Compare your feelings before and after making Lesser Pilgrimage to feel it. Compare your love to God before and after ‘Umra’. I’ll tell you something: I always perform Lesser Pilgrimage with young men. After we finish performing the Lesser Pilgrimage, we feel elated that we want to savor each and every moment! I am just telling you what happens to me after performing Lesser Pilgrimage; I feel so happy and overjoyed. Perhaps it is because love between God and me has increased! We feel happy and overjoyed on seeing the Kaaba, let alone seeing God, Exalted be He, Himself in the Hereafter?! If we feel elated on merely seeing the Kaaba, what about seeing God?! Imagine yourself standing before God, the Ever-Loving! “On that Day some faces shall be…Looking towards their Lord…” “You shall see your Lord on the Day of Resurrection as you see this full moon.” You will stand before God, the Ever-Loving, and hear Him say: “O My servant! I am pleased with You!” Imagine seeing God, the Ever-Loving, then! You should be eager to meet God, the Ever-Loving! We will sense how God is Ever-Loving in Paradise; Muhammad said about its dwellers: “They will neither have differences nor hatred among themselves; their hearts will be as if one heart…” The dwellers of Paradise will enjoy perfect love; in life, one may like to play football and his friend may like to eat, but in Paradise, they will all love the same thing! Consider a wonderful Saying by Muhammad that shows how God is Ever-Loving, even to the last one leaving Hell and going to Paradise! Listen to this Saying in which Muhammad (PBUH) said: “The last one to enter Paradise would be a man who would walk once, and stumble once and be burnt by the fire once.” He will cross the Bridge over Hell in this miserable condition; “Then when he gets beyond it, he will turn to it (Hell) and say: ”Blessed is He Who has saved me from you (Hell)! '” He would say about getting out of Hell: “‘God has given me something He has not given to anyone of the earlier or later times.’ Then a tree would be raised up for him…” He would look at it and find it so beautiful, having many fruits; though outside Paradise! “…he will say: ‘O my Lord! Bring me near this tree…'” God, the Exalted and Great, would say: “O son of Adam, if I grant you this, you will ask me for something else.” The man would say: “No, my Lord.” He would promise to ask for nothing else. “So He would bring him near it, and he would take shelter in its shade and drink of its water. After that, a tree more beautiful than the first would be raised for him and he would say: ‘O my Lord! Bring me near this tree…’ He (God) would say: ‘If I bring you near it, you may ask me for something else.’ He (the man) would promise Him that he would not ask for anything else…So He would bring him near it and he would enjoy its shade & drink its water. Then a tree would be raised up for him…” God will do this, leading him to Paradise bit by bit! The man would seek more of God’s Bounty and God would tell him: “Go and enter Paradise, for there is for you the like of the world and ten times like it…” God promised him all that he would please and desire and eternity therein! The narrator of this Saying smiled after narrating it; asked why he had smiled, he said the Prophet smiled after saying it! Asked what made him smile, the Prophet said God smiled when that man said: ‘Are You mocking me…? '” See how Loving God is! How to love by God’s Name, the Ever-Loving! Finally, let’s see how to love by God’s Name, the Ever-Loving! Endear yourself to God, Exalted be He! Turn to God with utmost love! Let your heart overflow with love for God! Love God from the bottom of your heart! Also, believe deep in your heart that God endears Himself to You! Never forget this! When you suffer in life, turn to God, the Ever-Loving! Pour your heart out to God and complain to Him, telling Him He is the Only One to help you! Ask Him to help you serve Islam! Tell Him to grant you steadfastness after Ramadan and save your children! Resort to God, the Ever-Loving! Finally, be loving to others! Spouses should be loving to each other! If God, the Exalted, listens to His servants when they address Him; women are to listen to their men. Do not turn a deaf ear to your wife when she pours her heart out to you! Learn to be loving to others! Be loving to your spouse and family! Teachers should deal with their students with love and care! Employers should deal with their employees with love! Policemen should be loving and kind to people! Learn to be loving like Prophet Muhammad! Ikrimah ibn Abu Jahl wanted to adopt Islam, so Muhammad told Muslims not to insult his late father as that would hurt his living son Ikrimah and would not reach his dead father! Choose kind words whenever you speak with others! Can you do like Prophet Muhammad? Learn from the Prophet and his Companions! This is how to live by God’s Name, the Ever-Loving! Turn to God, the Ever-Loving, tonight and pour your heart to Him; love Him sincerely and be sure He endears Himself to you, and be loving. In the end, I ask God to forgive us all! Time for prayer! The Quran’s teaching about love is deficient when compared with the Bible. Amr Khaled: “Muhammad said, “God is more Merciful to one than his own kind mother.” Parental love should make clearer the idea of God’s love for Man! Parental love is a sign of God’s love for us!” My comment: The Bible also speaks of God’s love in similar terms but goes even further to describe God’s love in terms of marrage (Ephesians 5:28-32). Amr Khaled: “Ali ibn Abu Talib said if he were to be given the choice, to be questioned on Doomsday by his parents, he would refuse as God would have Mercy on him more than his parents!” My comment: Where does God’s holiness fit with the Muslim understanding of love? Amr Khaled: “Surely those who believe and do righteous deeds, on them will God Most Gracious bestow His love” [Quran 19:96]. If you believe in God & do good deeds, God will show you special love. They will enjoy God’s special love infinitely in this life, in the grave, on Doomsday, and in Paradise. “…those who believe…”, not just martyrs or Prophets. “…on them will God Most Gracious bestow His love.” My comment: Is it loving for Muslims to reject God’s most gracious love demonstrated in history? Amr Khaled: “Do many good deeds and expect God’s Love in return!” My comment: God’s love is so great that we can do nothing to deserve it (John 3:16).